Life is a road with many story lines and each turn positions your promise. He is a double PK “preacher’s kid.” Both parents where pastors at some point during the early and latter part of Jonathan’s life. His mother and only surviving parent, Overseer Beatrice Vaughters, still pastors today. Jonathan grew up in a home that loved the Lord but saw every side of life. He was a child that went through the process of having both parents in the home, on to a single mother household, then to parent reconciliation until the passing of his father in 2008. All of this shaped how he feels about family and the precious lives of others. Therefore, he works hard to sow into his own family. Rev. Jonathan Vaughters married the love of his life, Shanny Vaughters, in the year of 2000. They have three children, Jonathan Jr. (18), Jaden (14) and Jaila (12). They were married early in life and have since loved to sow into other married couples in order to see the fruit of all Kingdom marriages increase with hope, commitment, and love. Rev. Jonathan Vaughters’ education is very diverse. A full-ride football scholarship led him to Winston Salem State University in 1995 where he double majored in pursuance of a Bachelor’s Degree in both Information Technology and Accounting. He matriculated successfully and graduated from the university with both undergraduate degrees in 1999. He later went back to graduate school with his wife in 2010. They both graduated in 2014 from Liberty University with a Master’s of Arts in Religion, with a Pastoral Counseling Cognate. Rev. Jonathan honored the call on his life in 2007. He was licensed as a Minister within the Ambassadors for Jesus Christ movement, and preached his initial sermon in 2008. In 2010, Rev. Vaughters moved to Cherry Hill, NJ with his family where the Lord led him to Bethany Baptist Church. Unbeknown to him at the time, he was in the presence of the Pastor and Teacher that would change his life forever. He began to serve in several areas of the church, including the Couples Ministry, and Youth Department while involved in Ministerial Training, and more. In 2016, after several years of service, Jonathan Vaughters, Sr. was elevated to the position of 2nd Assistant to the Pastor. He graduated from the Abundant Harvest Bible Institute, and was also ordained Reverend in April, 2017. Rev. 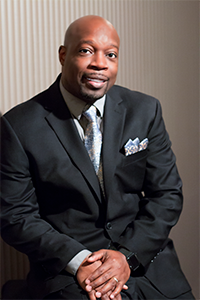 Vaughters continues to work as the 2nd Assistant to the Pastor, iPastor (Internet Pastor), Veteran Services Coordinator and Co-Director (alongside his wife) of the Linked Couples Ministry, as well as any other facet of ministry that is needed to assist his Bishop and Executive Pastor. He believes that the same Jesus that saved him and his marriage, can be the catalyst to transform absolutely anyone. He has a heart for all people, loves working to give hope to the hopeless, sets out to motivate those struggling to find their way, and most of all…seeks to witness to open hearts.